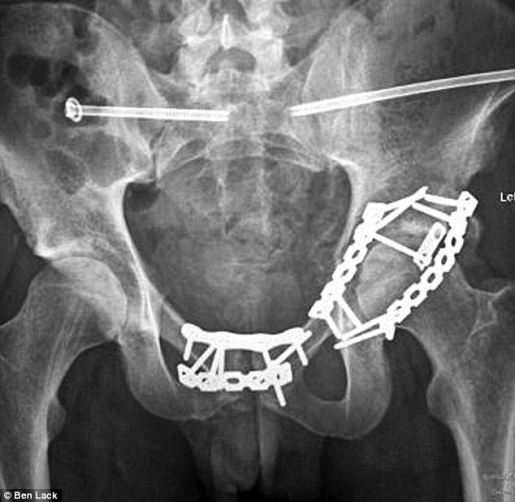 Matthew Lowe's shattered pelvis, held together by nails. It’s one of the most amazing stories of survival I’ve ever heard. A 25-year-old father of one from Birdwell, Barnsley in South Yorkshire named Matthew Lowe was sucked through a giant metal processing machine, had his entire body smashed and mangled, yet he’s alive today. Call it a miracle, because what he went through should’ve killed him. Matthew Lowe was pulled through a gap the size of a CD case and mangled by a machine, but he’s here today. All in all, Lowe survived with a broken right arm, shattered pelvis, broken back (in two places), fractured ribs (several), and a torn stomach and bowel. As you can see above, he was in a bad way, but the important thing is he lived. What saved Matthew’s life, aside from some talented surgeons? He went through the gap head-first, and his head made it through before the gap narrowed to CD case size. Matthew’s only continued problem from the accident is a weakened right arm. He’s still employed at Compass Engineering, and is training to be a site supervisor.